Air To Water Heat Pumps and Air to Air Heat Pumps use exactly the same principle which, as I can hear you all asking, "what’s that then"? Well to put it into a simple technical phrase you can summarise this by saying “The manipulation of the properties of refrigerant gas”. Now there are loads of good places on the web where you can get in depth technical descriptions of this process, so we will just give a brief description and concentrate on the practical aspects of this technology, and how it relates to domestic and commercial applications. You may remember from your school days that, apart from absolute zero which is -273°centigrade or there about, there will always be heat in the air. Consider when you’ve sat on a stone wall and it feels cold - well there you go, that’s basically the principle of heat pumps. Your bottom is warmer than the wall hence warmth is transferred from you to the wall. Using the same principle, if we have a refrigerant that is colder than the surrounding air, heat will be absorbed into the refrigerant. We can use this heat absorbed into the refrigerant and transfer it to an indoor unit. The heat is then utilised at the indoor unit to provide space heating, or via a heat exchanger to heat water which can then be used in an under floor heating circuit and to provide domestic hot water. Let’s talk about Air to Air Heat Pumps first. In this type of system you’re using the heated refrigerant going to the indoor unit and passing air over the heated coils to provide heat to a room. This type of technology has been around for a long time, but the usage of this technology in Britain is a fairly recent event. Us Brits like to use what we know so, hence, gas central heating has been probably the most common type of heating over the last three decades. There still tends to be a lot of misconceptions with regard to these systems and what they can actually do, so let’s give a few concrete facts to help you decide if this type of technology is for you. How Energy Efficient Are These Systems? - Well very energy efficient but, like fuel performance figures for cars, you tend to be given the best optimum conditions with the truth somewhere in the middle. You can get energy efficiency ratings of up to a SCOP value of around 6 on these systems. The SCOP (Seasonal Coefficient of Performance) value is telling you how much useful heat energy you’re getting out for every £1 pound of electrical energy you’re putting in. Hence a SCOP value of 5 means you will get £5 pounds of heat energy out for every £1 pound of electrical energy you’ve put in, which as I’m sure you will agree sounds very impressive. So basically the bigger the SCOP number, the more energy efficient the system is. As a good guideline any system with a SCOP value of 3.6 and above can be considered to be particularly energy efficient. Here’s the slight "but" though with these systems, and also why Britain has the perfect climate for these types of systems. Remember we said that the refrigerant is colder than the air hence it is absorbing heat. 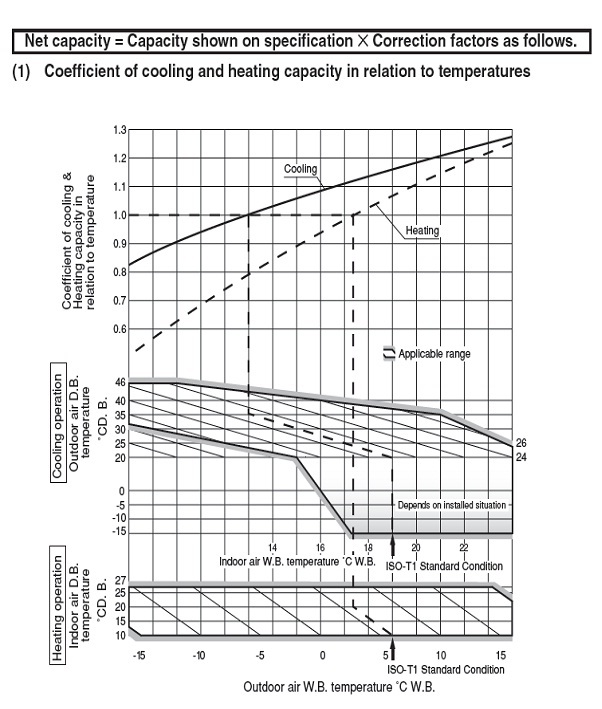 So basically this SCOP figure is telling you how much heat energy is being absorbed in relation to the input energy used. Now we're in danger here of getting a bit too technical so let’s keep things simple. Why Are They Suited To Our Climate? - Our climate is quite temperate and for most of the population it rarely goes below -10*c, and for 95% of the time temperatures stay within a range of (25°c) to (-3°c). The refrigerant temperature is around (-27*c) so useful heat transferred into the refrigerant will occur throughout this temperature range but, as we get to zero and below, less heat will be absorbed into the refrigerant from the air, hence our SCOP figure of say 5 drops. The system will still work and give the required heat output down to an outside air temperature of -15°c, but the SCOP value will decrease the colder you get. Now the reason we said these systems are well suited for the our British climate is the fact that, for around 90% of the time, you will get the SCOP values indicated by manufacturers, but when it does get cold and goes below zero the energy efficiency will drop. You can see below the SCOP graph of our best selling Mitsubishi Ultra Efficiency systems, and see how the outside air temperature effects the performance of the system. An air source heat pump has three different cycles which are the heating cycle, the cooling cycle and the defrost cycle. The Heating Cycle - During the heating cycle, heat is taken from the outdoor unit and transferred to the indoor unit. Firstly, the liquid refrigerant passes through the expansion valve, changing to a low pressure liquid / vapour mixture. It then goes to the outdoor coil, which acts as the evaporator coil. The liquid refrigerant absorbs heat from the outdoor air and boils, becoming a low temperature vapour. This vapour passes through the 3-way reversing valve to the accumulator, which collects any remaining liquid before the vapour enters the compressor. The vapour is then compressed, reducing the volume and causing it to heat up. Finally, the reversing valve sends the gas, which is now hot, to the indoor unit, which is now the condenser. The heat from the hot gas is transferred to the indoor area causing the gas to condense back into a liquid. This liquid is returned to the expansion valve where the cycle is repeated. The ability of an air source heat pump to transfer heat from the outside air to where it is required inside a building depends upon the outside air temperature. As the outside air temperature drops, the ability of the heat pump to absorb heat also drops, hence the rated SCOP value of the system drops. The Cooling Cycle - The cycle described above is reversed to cool the house during the summer months. The unit takes heat out of the indoor air and rejects it to the outside. As in the heating cycle, the liquid refrigerant passes through the expansion device, changing to a low pressure liquid / vapour mixture. It then goes to the indoor coil, which acts as the evaporator. The liquid refrigerant absorbs heat from the indoor air and boils, becoming a low temperature vapour. The vapour passes through the reversing valve to the accumulator, which collects any remaining liquid, and then to the compressor. The vapour is then compressed, reducing its volume and causing it to heat up. Finally, the gas, which is now hot, passes through the reversing valve to the outdoor coil, which acts as the condenser. The heat from the hot gas is transferred to the outdoor air, causing the refrigerant to condense into a liquid. The liquid returns to the expansion device, and the cycle is repeated. During the cooling cycle, the air heat pump also dehumidifies the indoor air. Moisture in the air passes over the indoor unit coil condensing on the coil's surface. This water is then collected in the drip pan at the bottom of the indoor unit. The water is then taken away via the condensate drain attached to the indoor unit drip pan. Defrost Cycle - If the outdoor temperature falls to near or below freezing when the heat pump is operating in heating mode, moisture in the air passing over the outside coil will condense and freeze on it. The amount of frost build up depends on the outdoor temperature and the amount of moisture in the air. This frost build-up will decrease the efficiency of the coil by reducing its ability to transfer heat to the refrigerant. At some point the frost must be removed. To do this, the air heat pump will switch itself into defrost mode. On most split system heat pumps when the system goes into defrost mode the indoor unit stops its heating function and turns the indoor fan off. Defrost mode is then turned on, which is basically cooling mode without the indoor fan on. This sequence will generally last around 10 minutes with the hot air being expelled at the outdoor unit melting any ice and frost build up. Typically you can expect an air source heat pump operating below an outside air temperature of 0°c in heating mode to go into defrost mode once every 2-3 hours.